Jen Welter is the first woman to coach on an NFL team. She describes her experience and what teamwork means to her. Jen Welter has had a career of firsts in a field dominated by men. After playing in professional women’s football, the 5-foot-2-inch powerhouse was the first female running back to play for a men’s professional league. In 2015, she became the first woman to coach in the NFL, serving as linebacker’s coach for the Arizona Cardinals of the National Football League. 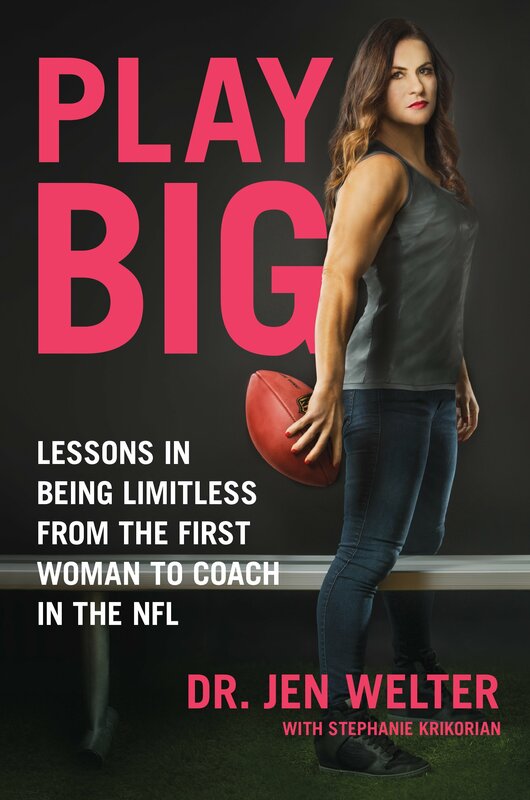 Welter’s new book, Play Big: Lessons in Being Limitless from the First Woman to Coach in the NFL, serves as more than a memoir about her time in pro sports. It’s also filled with smart advice about how to achieve success through strong leadership and solid support. Welter, who earned her doctorate in psychology and is a motivational speaker, joined the Knowledge@Wharton show on SiriusXM channel 111 to reminisce about her days in the NFL and drop a little wisdom. Knowledge@Wharton: Let’s start with your love of the game of football. You weren’t just a coach, you were a player in women’s professional leagues. Jen Welter: I was blessed with what I would call a storied career in football. I got to play for about 14 years in women’s football, and in that time we got four of the equivalent of Super Bowls for women. We got four championships, two gold medals. I think I was an eight-time pro-bowler — and all of that as the girl who was told the whole time that she was too little to do it. I love sharing that with people because they often have quite a different image of what success looks like. For me, it was all of 5’2″ in the ultimate boys’ club. Knowledge@Wharton: You write that you don’t want the book to be perceived as a football story. This is a life story that just happened to play out in the world of football, correct? Welter: Yes, and I think that’s important for so many people. I learned that lesson when I first got done with the NFL. I would talk to people and they were like, “I don’t know anything about football.” And I’m like, “Yeah, but this is life.” It’s not as if the fundamentals change just because the game is different. There are insights to the lives of people in football, but it’s stories and overcoming and even how to handle tough situations that could be on any field, in any field, across life. I want people to know that. I use lessons from one of the best leaders I know, (former Arizona Cardinals head coach) Bruce Arians. Bruce and I even talked about his decision-making process of bringing me in because that’s a tough choice. I always tell people, “Let’s not just focus on the fact that I did a good job — and I’m thankful that I did — but I had to get the opportunity to do that job.” The reason that happened is because I had a man who has a philosophy of, “No risk it, no biscuit. This is the right thing and we’re going to make this work.” He was willing to bet his entire coaching legacy on me. There are some parts in there that say how he set up this situation for success. To make this big move, he talked to his players first. He wanted to know that the guys were supportive and behind him because if the guys wouldn’t listen, it didn’t matter if I was the second coming of Tom Landry. It wouldn’t have worked. So, he got the buy-in from his players. They were excited and involved, and that’s something that I think is really neat. Once he had the players’ involvement, he took it up the food chain. Knowledge@Wharton: Take us through your interview process for that job. Welter: My entree to men’s professional football was the most painful way possible. I played a season in men’s pro football in the Indoor Football League for the Texas Revolution. That was also a first. I was a running back, so I literally learned my lessons the hardest way. I got tackled by those big guys every single day, but they taught me a lot in the process. We learned how to work together and come through our differences. After playing on the team for a year, we had a new head coach the following season, former Dallas Cowboy Wendell Davis. He saw the way me and all the guys were together. He called and said, “You have to coach my football team.” I was like, “No. Absolutely not.” He said, “What do you mean, no? Not a lot of guys are going to give you this opportunity. You’re taking this job.” I told him I don’t want to coach football. I’ve never even thought about coaching football. That’s a very real thing because I couldn’t look at the sidelines and say, “I want to be her when I grow up.” There were no women coaching in the Indoor Football League or any football league that I could see, so it had never crossed my mind as even one of the best players in the world. I essentially hung up on Wendell. He called back the next day and said, “Do you remember how I told you not a lot of the guys were going to give you this opportunity and you were taking this job?” I said, “Yeah.” He goes, “Good, because I took it for you. You’re coaching for me. And by the way, you can’t quit. Otherwise, the story for women coaching in men’s football will be, ‘We had a girl once, but she quit. '” So, I lovingly say that Wendell dropkicked me into success. He saw something in me before I even saw it in myself. In arena football, we practice really early in the morning because the guys have to go to their other jobs after practice. One particular day, I talked to my head coach about it and he said, “We should call Bruce.” I’m looking at him like he’s crazy because who am I to pick up the phone and call the Arizona Cardinals? But he challenged me to it, and I ended up with a lot of spare time on my hands that day. Being a female athlete is a full-time hustle. You have to have 47 jobs, and on that day I invented a new one, and it was not assistant coach. It was assistant to the head coach. I called the Arizona Cardinals on behalf of myself, as if I wasn’t myself. I worked my way to Bruce’s assistant, Wesley, who told me, “I think Coach Arians would really want to take this call.” I made it sound really good, you know. But he said, “We’re a little busy.” It was right before the NFL draft. I can’t imagine why he didn’t have time just to take my phone call! I thought I had gotten blown off but I was really proud of myself for calling. About two weeks later, I walked into practice and my head coach was elated. He said, “You’ll never guess who I talked to yesterday for about an hour.” I said, “I have no idea. It’s like 5:30 in the morning. I’m sleepy.” He said, “It was Bruce Arians and he said, ‘Tell me about this girl.’ ” Bruce eventually invited me out to organized team activities, and I’m on the sidelines and meet Bruce for the first time. Here is this man who is the most powerful man out there, hands down. He is the head coach of this team. The closest I’d ever been to the sidelines of an NFL game at that point in my career was the nosebleed section, yet you would never know. Bruce came over to me, and I was the most important person on that sideline, at least in his eyes, for about 30 minutes. Knowledge@Wharton: You were there for the pre-season in 2015. What did you learn in that time that has stuck with you the most? Welter: There’s so much, and a lot of it started that day. It’s really about leadership and listening, investing in someone else and getting to know them as an individual. Bruce says he wants to know if you can read somebody’s eyes, and he liked the way I read their eyes. What that means to Bruce is being able to look at somebody and know that no two people are alike. Can you see what’s different in one guy than the other? Can you give them what they need? Or can you see a guy when he’s gotten lost because he took the coaching too hard? Or can you invest in somebody who is down on themselves? Bruce used to say he learned that ability from when he was a bartender. I think one of the greatest business lessons or life lessons that we forget sometimes is the power of the individual within a group. That should never get lost. You are powered by your people and your people are your most valuable asset because nothing functions without them. In this industry, we often forget that these men are not gladiators. They’re not robots. They’re not super heroes. They’re very real people inside of very real paths. It’s about being 100% authentic. It is not trying to coach like somebody else or be like somebody else or lose yourself in the process. It’s realizing that everything about you, every bit of experience that has come to make you exactly who you are, makes you uniquely qualified. You have to honor that voice and that vision because that’s what teamwork and leadership is about — owning your own special sauce and being willing to chime into the conversation. Knowledge@Wharton: The first game that you were coaching, you wanted to do something special for your players. You couldn’t go into the locker room, so you decided to write notes to the players to inspire them. In a business sense, that story shows the level of communication you can have with employees to make them better. Welter: And it shows how much you care. Writing those notes came from the advice of one of my very dear friends and mentors, who unfortunately passed away, Terry Glenn. We coached together at the Revolution. Before I left, he said, “Jen, I’ve been thinking a lot about you going to the NFL, and the best advice I can give you is to be 100% authentic. If you are exactly the same person that you were with us here every single day with those guys in the NFL, they will absolutely love you. But if you’re fake in any way, they will sense it and eat you alive.” It’s the truest thing I can say about those guys because they really did embrace what made me different, and part of that was those notes. Knowledge@Wharton: It is amazing what that relationship is inside that locker room or within that community. It can be the same thing in the business world, especially with companies now looking to have more teams. The relationships are critical to success. Welter: Absolutely. We all know this intuitively, but I don’t think we talk about it enough. We can see it physically in sports when performance varies quite a bit from one day to the next. One day you’re the superstar, the next day you look like you’re in the wrong building. When that difference happens dramatically, the difference isn’t physical, it’s mental. Generally, what has happened is something outside of your life is impacting your performance. I don’t care how good you are, you don’t always leave those things at the door. Great leaders and great teammates recognize this. Like, “Hey, what’s going on? Do you need to take a minute to talk?” Those little things become really big things, because then it’s not just a job. It’s something that you enjoy doing because of the people that you are doing it with. You know you can huddle up with these people, even when the world isn’t being so kind or something is going terribly wrong, or you’re worried about your child or your mom or somebody outside of there. When you have that relationship of the people that you want to be in the trenches with, that you care about, there’s not much that beats that. It can’t and shouldn’t be overlooked. Enhance your leadership skills and advance your business acumen with a focused curriculum that covers finance, leadership, marketing and strategy. Earn Wharton alumni status upon completion of six open-enrollment programs. Learn more.